Sherrill Whiton Correspondence: In addition to being a leading educator in the field of interior design, NYSID founder Sherrill Whiton was also a benefactor. This 1928 letter was written to Whiton to thank him for sponsoring the recent Beaux-Arts Institute’s annual design competition. The Institute, of which Whiton was a long-time member, was formed in 1914 by former students of the Ecole des Beaux Arts in Paris who wanted to bring the Ecole’s standard of architectural education to the United States. The Institute taught classes in architecture as well as mural painting and sculpture, and held an annual design competition. Vintage Wallpaper Samples: In 1997, NYSID’s Librarian Jean Hines acquired more than 70 vintage wallpaper samples from the Metropolitan Book Auction to serve as a study collection for students. The samples, now safely housed in the Archives and available for research, range in style from the Neoclassical, to Arts and Crafts and to Art Deco. Pictured is a frieze of an outdoor scene (complete with Birch or Aspen) and framed with flowers. Beautiful! Rochelle Edelson Student Work, 1961-1966: Recently, NYSID alumna Rochelle Edelson donated some of her student work from the mid-1960s to the NYSID Archives. Edelson’s binder of notes, drawings, and watercolors is a meticulous and complete picture of what a student of the NYSID Home Study Course was expected to accomplish at the time. 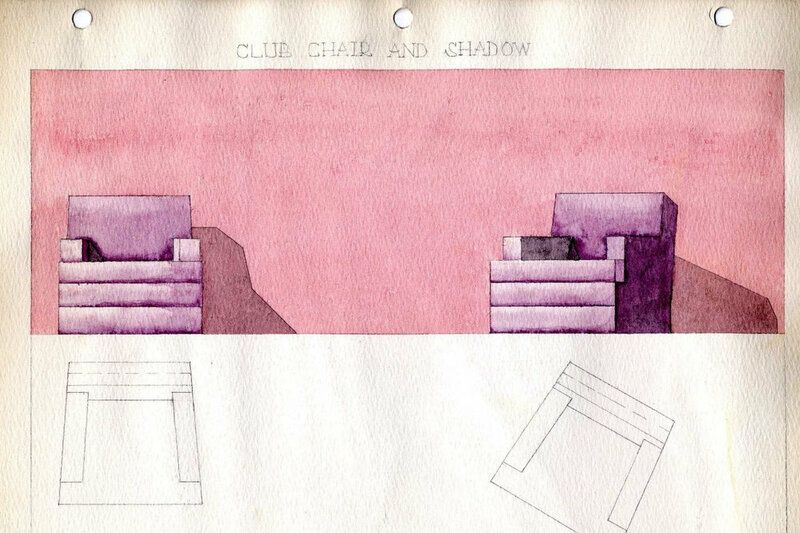 Pictured is “Plate XXIII,” an exercise in scale for a club chair done in watercolor in 1961.